Castle Clinton, also referred to as Castle Garden, is a fort and national monument located in Battery Park at the southern tip of Manhattan in New York City. The structure has served as a fort, theater, opera house, national immigrant receiving station, and aquarium throughout its long history. Today, Castle Garden is called Castle Clinton National Monument and serves as the ticket center for ferries to Ellis Island and the Statue of Liberty. Castle Clinton began its interesting life as a fort built to defend New York Harbor from the British during the War of 1812. Twelve years after the war it was ceded to New York City by the U.S. Army. The former fort reopened in 1824 as Castle Garden, a public cultural center and theatre. Following the passage of the Passenger Act of 3 March 1855, designed to safeguard the health and welfare of immigrant passengers to the U.S., New York passed its own legislation to establish a receiving station for immigrants. 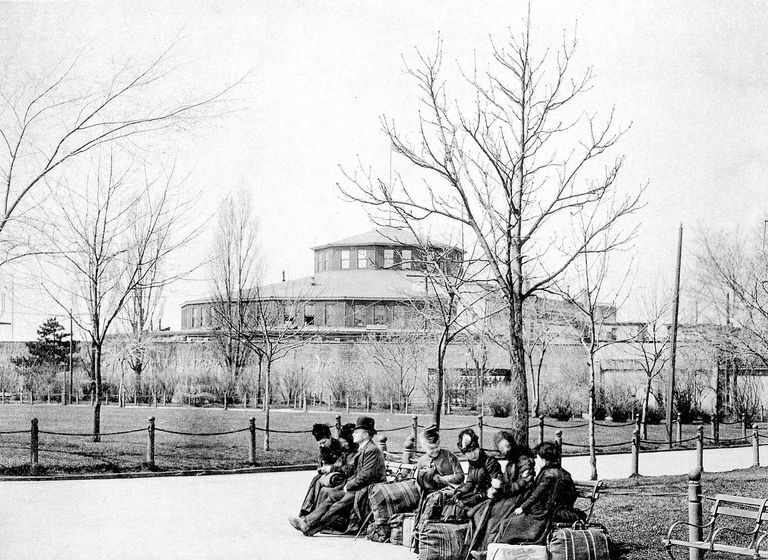 Castle Garden was chosen for the site, becoming America's first immigrant receiving center and welcoming more than 8 million immigrants before it was closed on April 18, 1890. Castle Garden was succeeded by Ellis Island in 1892. In 1896 Castle Garden became the site of the New York City Aquarium, a capacity in which it served until 1946 when plans for the Brooklyn-Battery Tunnel called for its demolition. The public outcry at the loss of the popular and historic building saved it from destruction, but the aquarium was closed and Castle Garden stood vacant until it was reopened by the National Park Service in 1975. From August 1, 1855 through April 18, 1890, immigrants arriving in the state of New York came through Castle Garden. America's first official immigrant examining and processing center, Castle Garden welcomed approximately 8 million immigrants — most from Germany, Ireland, England, Scotland, Sweden, Italy, Russia, and Denmark. Castle Garden welcomed its last immigrant on April 18, 1890. After the closing of Castle Garden, immigrants were processed at an old barge office in Manhattan until the opening of the Ellis Island Immigration Center on 1 January 1892. More than one in six native-born Americans are descendants of the eight million immigrants who entered the United States through Castle Garden. The free CastleGarden.org database, provided online by the New York Battery Conservancy, allows you to search by name and time period for immigrants who arrived in Castle Garden between 1830 and 1890. Digital copies of many of the ship manifests can be accessed through a paid subscription to Ancestry.com's New York Passenger Lists, 1820–1957. Some images are also available for free on FamilySearch. Microfilms of the manifests can also be obtained through your local Family History Center or National Archives (NARA) branches. The CastleGarden database is down somewhat frequently. If you receive an error message, try the alternative search features from Steve Morse's Searching the Castle Garden Passenger Lists in One Step. Located at the southern tip of Manhattan, convenient to NYC bus and subway routes, Castle Clinton National Monument is under the administration of the National Park service and serves as a visitor center for Manhattan's national parks. The walls of the original fort remain intact, and park ranger-led and self-guided tours describe the history of Castle Clinton / Castle Garden. Open daily (except Christmas) from 8:00am to 5:00pm. Admission and tours are free. How Did Your Ancestor Come Through Ellis Island?